Zoom Whitening is one of the quickest safest and more effective dental treatments for whitening your teeth. Zoom is FAST! 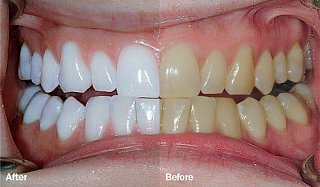 A brighter smile in 1 hour (up to 8 shades), used as a booster for optimal results which can be complemented with 2 weeks of bleaching trays. All Zoom procedures include a free bleaching tray which are customized to your smile. These trays can be used and kept indefinitely. For Optimal results 1 x per day @ 30 minutes. ZOOM is proven SAFE! Long-term tray whitening, along with many whitening toothpastes can be abrasive to your enamel (the outer surface of your teeth). With ZOOM, 8 shades lighter in 1 hour is an extremely attractive way to boost your natural smile without the added months of lightening your teeth with trays. *** lightening 8 shades of staining can sometimes take up to 3 months of continuous use of bleaching trays alone to achieve. ZOOM is proven EFFECTIVE! Well, that’s because it works. New LED technology helps the light activated gel (hydrogen Peroxide) without harmful added heat that UV light can generate. In conclusion Zoom with whitening trays is the most effectively proven, safest, and fast way to lighten your teeth! Call in the Best Dentist North Vancouver to book your appointment today! Next Post:What is Sleep Dentistry?